Can you give our readers a little bit of your background? How and why did you and Norm start the business? Whilst pursuing a different career path, I studied interior design as a hobby and loved it, I always felt that I was destined to create a business from scratch and yearned for it to have something to do with interiors. Due to a lack of interior design services and products in Bendigo, I felt that there was a huge business opportunity. The timing wasn’t right though, as I had just had my first child and was working part time in a job I loved. One day I thought, after I have my family… then a course of events took place that changed everything. I fell pregnant with my second child and at a routine pregnancy ultrasound discovered that I had ovarian cancer. Things changed very quickly, I gave up my job and put everything into getting well. I had major surgery whilst 13 weeks pregnant, where they did as much as they could without putting the baby at risk, the remaining surgery had to be done immediately after his birth. If you do the math, you will see that leaves about 5 months in between. That is a lot of think time, not good for someone that is used to being busy… so what better time to realise my dream… so with my 15 month old in toe, and the help of close family, I came up with the name of my new business, Make Your House A Home, registered it, wrote a business plan, had business cards printed and built a website. Just before I was due to give birth, it was all neatly packaged up and put to the side whilst I shifted my focus back to me and my baby. The birth went well, my operation went as well as could be expected and the road to recovery began. As a family we changed focus, my husband sold out his share of a business he had been a partner in for 18 years and we decided to live for the “now”. 12 months later and in remission, it was time to start looking to the future and how Make Your House A Home fitted into that. It had been a great distraction whilst sick, but now needed to support us. The website was achieving good sales, I was doing interior design consulting work and Norm was doing garden designs. We were operating from home with 2 young children, less than ideal, when one day my best friend called me and said I have found the shop for you! She was right, it was about 400m2, large enough to have furniture and other interior products on display with a warehouse area out the back, perfect. 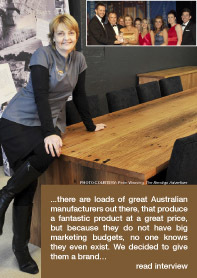 So we employed staff and started retail life, just over 4 years later we outgrew that showroom and moved to a larger showroom of 1200m2 on the main road into Bendigo, which is now considered the “go-to” place for quality furniture and décor in Central Victoria. How is Make Your House A Home different to its competitors? Tell me about myhah DESIGN and why you created it? If a product meets this criteria, we attach a myhah DESIGN badge to it as a quality assurance guarantee. Make Your House A Home won the ‘Australian Furniture Retailer of the Year’ at the Australian Furniture Association’s recent awards ceremony. What has been the biggest influence in your business’ success, and why? Because we don’t come from a furniture background, we see everything from the side of the consumer… if in doubt with any decision, we ask ourselves what would we, as a consumer expect, and then do it.. Humility has been forgotten in retail furniture…not sure why… but it has… consumers want to be excited, stimulated and wowed.. if you don’t wow them, they will be off to explore the next big thing.. if you do constantly wow them… they are yours forever.. we have built a very strong engaging database of followers, that are loyal, repeat purchasers… in turn we are the same with our suppliers, if they treat us well, we are loyal to them… we were nominated by our suppliers which we are very proud of, the judges said that they loved the way we married the interior decorator service into our day to day retail activities… they work beautifully together and that is the secret to our success.. It was a national award, so you must have beaten larger metropolitan companies. What additional challenges do you think regional businesses have to overcome to succeed? Living on a shoestring and making sacrifices financially ... we gave up very well paying jobs so it was difficult but we knew it would pay off in the long run.. Luckily we owned our house, so didn’t have to make mortgage payments which made living week to week a little easier. Ensure you are financially independent, because if you aren’t it will strangle your business.. you need to have some breathing space… equally as important, be passionate about what you are going to do, if not, you will find it very difficult to put in the hours needed to make it work… Thirdly have family support, it would be very difficult to create a successful business from scratch without a great support network And finally, hire yourself an excellent coach as we did… if you are really serious about your business (and you should be) you need a coach… I mean you wouldn’t think twice about being coached if you are playing a sport professionally. It is even more the case in business, as your financial life and that of your family is at stake and not something to take chances with… When I say hire yourself a coach though, it has to be the “right” coach. They need to not only be effective communicators and good at what they do, you also need to be in sync with them - no one is going to take advice from someone they don’t “like”. We had Kylie Blanchard from 10x Bendigo and she was (and still is) great… Both my husband and I get along really well with her and she is a great “fit” for us, our business and our team. It is great to have an outsider as passionate as our business as we are! What are your personal goals for your business in the next three to five years? We are working very hard at the moment to streamline and systemise our business so we can duplicate it.. Not sure whether that will be as a franchise or license model. The only way to create real wealth is through duplication and acceleration… we are presently investigating different business models to see which will best suit our needs. Which entrepreneur would you most like to emulate and why? Hands down, Richard Branson.. I want Make Your House A Home to be a brand name like Virgin is. I love the way he gives back to causes he is passionate about and I want Make Your House A Home to be seen in the same light. I am very passionate about a couple of causes and want my business to be successful so I can make a real difference to those charities and be a great example to my kids, so they carry on the business with the same mindset. I firmly believe that it is not just about money, it is about what you do with the money… that changes lives. What are your top 5 tips for business success? As a Woman in Business, what advice would you give for other women trying to emulate your success? Develop a thick skin, the more successful you are, the more you are copied and put down, but don’t ever let that stop you!